The positive reception to the Kinit Beta app has been amazing. We’ve found that users are excited to earn Kin so they can start spending it in the app on offers from Amazon, Google Play, and more. One common piece of feedback was that people wanted more ways to earn Kin. That’s why we’ve partnered with Swelly, a polling chatbot, and true[X], a next-generation technology company leading the charge in building attention-based ad products. Through these two new partners, we’re fueling Kinit with enjoyable and interactive earn experiences that Kinit users are sure to love. Swelly has built a survey platform that allows brands to receive feedback from specified target audiences, while keeping the users’ data anonymous. In fact, brands like, Red Bull, Swarovski, and more already use ‘Swells,’ the company’s name for its surveys, to obtain millions of consumer responses to quick, image-based polls. Similar to the earn tasks already available in Kinit, users will receive predetermined amounts of Kin in exchange for completing these easy, low-effort polls and surveys. The content delivered by true[X], an independent unit of 21st Century Fox, seamlessly fits into the Kinit experience. In exchange for Kin, Kinit users will now engage with interactive 30-second experiences from true[X]’s premium network of brand partners. In 2018 alone, true[X] has won awards for interactive ad campaigns for clients Mondelez, Harley-Davidson, Sonic, and more. Previously, true[X] supported Kik Points, the experiment with in-app currency from our first ecosystem partner, Kik. Just as it did then, true[X] will continue to provide users with relevant, engaging activities that enhance the user flow, while rewarding them for their time. As we uncover more insights, we will apply these learnings and expand use cases for Kinit. 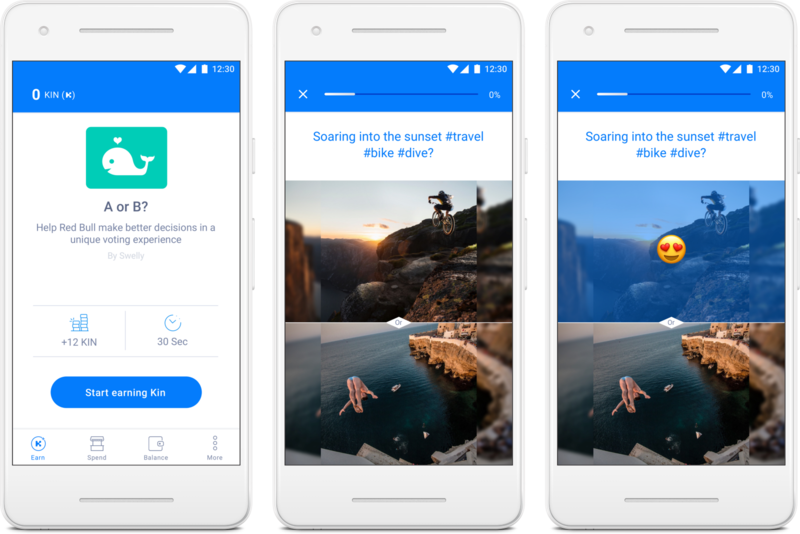 Download Kinit to start completing tasks to earn your Kin today, or let us know if you have any feedback on how we can improve the experience.